This Op-Ed piece, authored by Bill Layman, originally ran as an article "The $100,000 Rescue - When Personal Locator Beacons do-and don't- make sense," in the Fall, 2002, issue of KANAWA, the paddling magazine of the Canadian Recreational Canoeing Association. Re-published here by permission of the author. © 2002 Bill Layman - All rights reserved. The opinions expressed in this article are those of the author and are not necessarily endorsed in whole or part by Equipped To Survive. This is presented as a public service and to further discussion of the issues. INUVIK, N.W.T (CP) --� An American paddling in the Northwest Territories missed a rendezvous with a bush plane sent to pick him up, so he set off a downed aircraft signal that triggered a $100,000 search and rescue operation. The man,� whom RCMP identified only as a librarian from New York, was finished a 14-day canoe trip from Coleville Lake to the Anderson River, a remote area north of the Arctic Circle. Sgt. 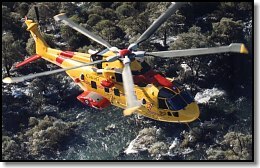 Mark Wharton of the RCMP estimated the rescue cost $100,000 including the $9,000 per hour Hercules aircraft and helicopter sent from Ontario. He said the man has since learned his lesson and will face no charges. I have paddled in Nunavut and the Northwest Territories for the last seven years with my partner Lynda Holland.� We now have well over 5000 kilometers under our belts, and stories like this one drive me crazy.� I wish I could say it was an isolated story about a naive New Yorker! - but it isn't.� These kind of, what I like to call, Dumb Paddlers Who Should Learn to Bowl Events happen year after year in Nunavut and the Northwest Territories. Witness the year my own Personal Locator Beacon (PLB) was lent to a commercial outfitter who took a very rich Italian client on� a 200 kilometer stretch of the Kazan River from Angikuni Lake to Yathkyed Lake. When their canoe blew away - because they made the fatal mistake of storing it upside down - they set off my PLB, and were rescued by a helicopter from Rankin Inlet. This in spite of the fact that they had everything but the canoe, and a float plane was going to come to pick them up in less than a week.� They could have had a great week of hiking, fishing and general sight seeing - after all many people have been wind bound for a week.� But nope, the Italian got all poutty and brow beat the outfitter into "calling for help." And was the rescue bill big? Have you ever chartered an A-Star helicopter?� I have, and if you threw a twenty dollar bill out the window every minute you would be getting close.� And who paid the bill?� You got it; you and me, the ever generous Canadian Taxpayers.� The outfitter had also borrowed my Marine Defender shot gun, and I still wonder why he didn't just shoot the client. In other words, have a rescue plan for when your first rescue plan doesn't work! We have never had trouble on our trips, but if we do, we are prepared. We carry a Globalstar satellite phone, a VHF air-band radio, and a PLB. The first two units form our first line of defense and the latter is held in reserve for when the you-know-what hits the fan. The satellite phone is self explanatory.� You can phone for a plane, tell your mom where you are, or buy and sell stock from your canoe – it works just like your phone at home.� The VHF air-band radio allows you to talk to bush planes when you find yourself in trouble, and the PLB can be activated in the event of an all out disaster. Truth is you can probably skip the VHF radio. All you really need, in my estimation, is the satellite phone and the PLB. During your trip, if you have to activate your PLB, a DIRE EMERGENCY SOS signal is relayed by satellite to a ground receiving station and passed on the Canada's Mission Control Centre (MCC) at Canadian Forces Base at Trenton, Ontario.� Every PLB has a uniquely coded signal, so that when one� is activated, the MCC not only has your location pin-pointed, but from your pre-trip registration, they know who you are, and all of your trip details. When they receive your PLB distress signal, they initiate a rescue based on your pre-trip instructions that you filed with them. In our case, since we are doing a different canoe trip each year, I ask that the MCC phone my home-town La Ronge RCMP where I leave detailed trip notes.� In the highly unlikely event that the MCC can't contact the RCMP quickly enough, they will initiate immediate rescue based on our location, and the best means that they can establish.� In any case, rest assured that a rescue attempt will be made with utmost urgency. Prior to last summer's 730 mile Dubawnt River trip I filed a package with the La Ronge RCMP (where I live),� the Stony Rapids RCMP (my departure point) and the Baker Lake RCMP (my end destination).� In this package, I included a route map, our departure and expected arrival dates, the colour of our canoe, tent and cooking fly, and a list of our survival communications (Globalstar phone, VHF radio, and PLB).� As well, I indicated that my PLB is strapped to my life jacket, and that if it is activated, we are in DIRE NEED OF ASSISTANCE, and that all other means of communication have been lost - say in a canoe capsize – or are being used simultaneously.� As well, I provide the RCMP with a list of logical phone numbers to seek float-plane air support from.� Last year I gave them the numbers for Selwyn Lake Lodge, Tukto Lodge on Mosquito Lake, and Kasba Lake Lodge.� These camps are "bush smart" and would probably be the best bet for us in an emergency as they are close and know the area.� As well, they know how tough the arctic can be and all bend over backwards if there is an emergency.� I have often thought that getting a big pre-trip cash loan from the camps along my route would guarantee that they would find me real fast! Many people are now relying solely on their satellite phones.� I think this a big mistake.� I can just see it. The canoe is lost with the phone in it, or the phone is soaked and not working, or the person in need of help is in shock and or hypothermic and unable to clearly provide location and situation details. My advice is to take a� PLB and keep it on your lifejacket in case you have a bad swim. 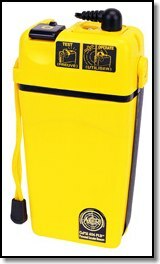 And don't even think about using an EPIRB (Emergency Position Indicating Radio Beacon) or an ELT (Emergency Locator Transmitters) rather than a PLB.� The former are really for the use of large ships while the latter are for airplanes.� The older generation EPIRBs and ELTs, which operate on 121.5 MHz., send generic, non-personally coded signals� which are respectively understood by the Rescue Center as "Ship is sinking" and "Plane has crashed." Somehow these 121.5 MHz. beacons are making their way into the hands of canoe groups.� Even the newer generation of these beacons that operate on 406 MHz., and which are supposed to be individually registered as is my PLB,� are not designed with canoes in mind.� That's what the PLBs are for.� People who take ELTs and EPIRBs with them in their canoe drive me crazy. And remember, even if you have the correct type of beacon in your canoe with you,� it's still a subjective call on your part when you set the beacon off.� Here's a few more examples of people I think who should learn to bowl. This year the folks at Tukto Lodge told us about a Japanese kayaker that set off his EPIRB on the Thelon River and had a military Hercules air transport, complete with SARTEC parachute teams ready to deploy off the end ramp, circling over him within hours. Or what about the German man and son who set off their ELT?� The folks in Baker Lake are still talking about that one.� There was� a Twin Otter on tundra tires in Baker, and it was� sent out to find the plane that they were advised had crashed. The only problem was that when they got to the crash site they couldn't� find a plane – all that was there was a tent.� The Twin Otter pilot did a hair raising landing on a nearby gravel beach almost making his plane the crash site!� The paddlers walked over and thanked the pilot for coming, and asked if he would mind waiting while they packed up their camp gear. "We are tired and my father's war wound is making it hard for us to paddle," they offered by way of explanation. Anyway you no doubt get my drift.� This is crazy, and it's all funded by the ever generous Canadian Government.� I think it is incumbent on paddlers, who can afford to do these remote trips, to do them right and plan for emergencies in a double redundant fashion.� In other words, as I said before, have a plan for when your first plans fails.� If nothing else, it would sure help keep our taxes down.� As to the out-of–country paddlers, there's only going to be way more of them every year. So why don't we legislate that all Arctic paddlers have to rent or own PLBs? Failing that perhaps they should pay for the rescue if it's as dumb as the ones I told you about above?� Or, failing that, perhaps an IQ meter should be given to all the Customs Officers so they can weed out the idiots who want to see the north? 1. You can bet your bottom dollar that Vilhjalmur Stefannson would have taken a PLB and a satellite phone if he could have. 2.� If you don't take a satellite phone or PLB with you, when you are overdue, due to delay or death,� the RCMP will initiate a search, and it will cost a small fortune because they won't know where to start to look.